RAGENHEART have just released their long-awaited second album called "The Last King". Angel Priest was kind enough to answer our questions and shed some light on what's going on at the band's camp. Greetings Angel! I’m sure that most of our readers are familiar with RAGENHEART and your work from back in the day, but for the sake of keeping everyone on the same page, could you please introduce yourself to the readers? Of course. The band was formed in 2002 by myself and John Koroneos on the guitars and vocals respectively. The lineup and the name of the band (RageNHeart: Rage in Heart) were consolidated soon after that. With Nikos Mihalakakos (bass), Stavros (keyboards) and Nick Speed (drums) we recorded a demo in 2006 that had a great reception both in Greece and abroad. Soon afterwards we entered the studio to record our first full-length [Ragenheart], which ended up being released in 2010 by the Italian Metal on Metal Records. In 2013 we started working on new material that eventually resulted to “The Last King”, our second full-length album, which got released in spring 2018. 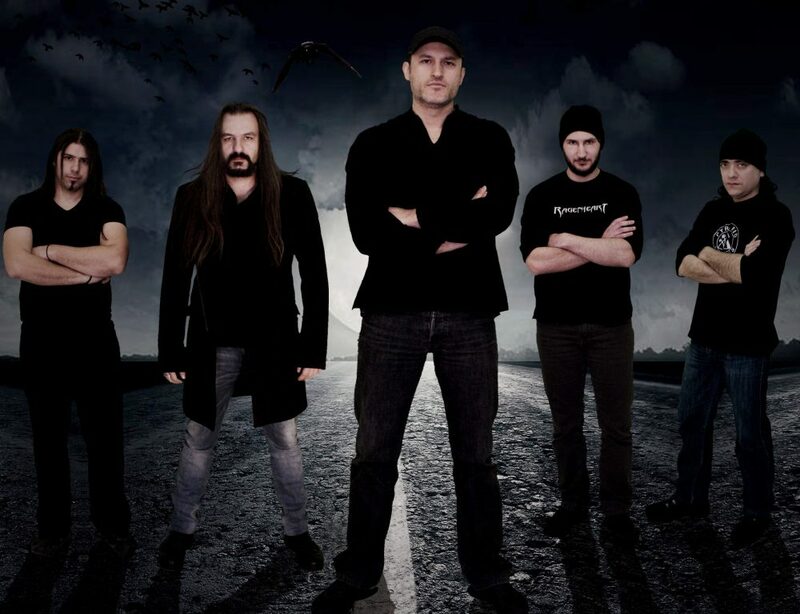 At the moment RAGENHEART consists of John Koroneos – vocals, Angel Priest – guitars, Takis Koroneos – guitars, Nick Michalakakos – bass and Nick “Speedy” – drums. We’re about eight years after the release of your first album. It’d say it’s quite a break and despite some updates on social media, for the most part you’ve been off the radar. What happened? Nothing wrong actually. Up until 2013 we were doing some live shows to promote our album and at the same time we’re working on new material, rehearsing etc. Once ready, we entered the studio to record tracks for the new album, something that went on at a slow but steady pace. All this time we were off the radar because we decided to refrain from any live shows until we had a second release. We wanted to enrich and extend our setlist and we considered having a new album as the best way to do it. When did “The Last King” began to form as an album? Is everything on it new material or are there any tracks that date back to the first era of the band? We started working on it sometime in 2013 when we composed the first songs that made their way into the album. If not mistaken the most recent track dates back to 2015. In this album you’ve undergone a fundamental change in your lineup. You swapped the keyboards for a second guitar but despite that, keyboards are still present in some of the songs. Given you used to perform live having both keyboards and a second guitar, what was the reason behind such change? Should we expect shifting towards a heavier sound? Very good observations. Our second guitarist, Takis Koroneos, joined the band soon after our first album was released and as a result, we got to perform live as a six-piece for sometime. Unfortunately, our keyboardist left the band before we entered the studio to record the “The Last King” album, so Takis took on the task of recording the keyboard parts as well. We weren’t planning to replace the keyboards with a second guitar, so we still need to figure out how to deal with this on stage. However, we didn’t want to have keyboards in every song of the album due to the particular style and nature of each song. As for shifting towards a heavier sound… hmm? To be honest, I can’t tell how new material will sound like… For example, in the past we didn’t use to write songs in the style of “Fear”. This time, however, we tried it, we liked it and so it made its way to the album. Would you like to share a few information about having a guest composer to work on the symphonic parts of the album? How did you end up working with John Skalkotos? We wanted to have some parts of the album done with orchestral instruments, as it’s something we hadn’t done in the past but we enjoyed the idea for this album. More specifically, we wanted to do it for the intro, “The Last King” and “Dreamer”. We also felt it was necessary for what we’re trying to achieve with these songs. However, as I said earlier, with our keyboardist out off the band, none of us knew how to do it so I ended up contacting John, because I knew he had the skills for such a task. He liked our material, so he started working on in without getting any direction from us. As soon as we heard the final result, I’d say it exceeded our expectations by far and we felt we’re right for choosing to experiment in the first place. There were some discussions about maintaining a steady collaboration with him (e.g. for performing live), but it’s quite difficult due to his work schedule and commitments. Listening to “The Last King”, I’d say you move between the lines of “classic” heavy metal and “modern” power metal, while melodic elements remain on the spotlight throughout the album. How would you describe your music? It’s exactly as you said it. Also, I’m not able to fit our music into a single category. This is due to our influences which are drawn from classic rock, but also span from classic 80s heavy metal to modern power metal. It’s a multidimensional album. There’s a lot of diversity when it comes to style throughout the album. There’s the epic feeling of “The Last King”, the aggressiveness of “Fear” and at the same time, there are more laid-back songs like “Metal Rules the Night” and “Dreamer”. How to you work when it comes to songwriting? The only thing for sure is that we’ll always be characterized by such a diversity in our sound. We don’t like to compose in specific way or limit ourselves to only one style. We want to explore new ideas and surprise both ourselves and our listeners in pleasant way. And always through heavy metal. Indeed, the songs you mentioned are 100% pure Ragenheart songs, but their style differs. It’s unintentional, but of course the theme and mood of the song might play a role in it. When it comes to composition, it mostly falls on myself and John. In the previous album both Nick and Stavros had contributed in the writing process, but in “The Last King”, all of the songs were written almost exclusively by me and John. The process varies and it depends on the case. For example I might write the music for a song and John will come up with the lyrics, and vise versa. John is a great musician and can come up with a guitar riff or a melody that’s optimal for him to sing along. Due to his wide vocal range and his perception of music, I have the luxury to use different scales and write songs in different styles, from a soft-ballad Then we work together with everyone during rehearsals until we reach the desired result. Band influences and favourite albums? Well, for me, personally I’d say I’ve been influenced from guitarists such as Viv Campbell, Zakk Wylde, Yngwie, Adrian Smith, Victor Smolski, Joey Tafolla, John Sykes and bands like Crimson Glory, Gargoyle, Hittman, Priest, Accept, Lethal, ‘Ryche, Stormwitch, Dio, Evergrey, Magnitude9, Kamelot, Rainbow, Conception, Disturbed, Savatage, Riot, Sabbath (Martin Era). The rest of the guys are more into “classic” heavy metal stuff . Nick (bass), for example, digs Jimmy Bain, Geezer Butler and Black Sabbath while our vocalist is into some of the bands I mentioned earlier plus Whitesnake, Deep Purple, Maiden etc. Would you like to share a few info about the production of the album? The recording sessions took place at «SoundAddict Studios» which are owned by our guitarist, Takis Koronaios, who also happens to be a sound engineer & producer by trade. We were extremely fortunate to have someone from the band, who already knew our sound and our goals, in such a role because it worked out seamlessly for us. He guided as throughout the whole recording process, as a producer does, and was responsible for the mixing and mastering process as well. He’s constantly evolving both in skill-wise and equipment-wise to keep up with today’s standards. Talking about lyrical themes, the title, the album cover and the opening are dedicated to Byzantine history and Constantine XI Palaiologos, the so called Last Emperor. Why did you choose it? This came out naturally for us because from the beginning of the band, we always had songs with historical themes (for example “Talos”, “Spartan” etc). History is a huge source of inspiration, but at the same time, the history of the Byzantine empire has been left out from industries like heavy metal music and Hollywood. I consider the relatively short story of Constantine Palaiologos and the battle he fought to save whatever was left from the Empire, one of the most epic battles of all time. His bravery, courage, commanding skills and morality, definitely deserved to be sung in a heavy metal song. Also, his stance turned out to be timeless, as it outlived both him and his era. He took on the great responsibility to rule without complaining about the mistakes his predecessors made, he turned down Sultan’s “memorandum” despite the “price” and died by defending his decision and the his people honor. We experience these kind of situations even today, but none has the courage to say “no”, at all costs, to the oppressors. People like Constantine Palaiologos are imprinted in history and act as a reminder for us all. One afternoon, when I was reading again about his final battle, the riff popped into my mind, so I grabbed my guitar and I started to write the song. I have to confess, after seeing the cover and watching the video I was expecting [The Last King] to be a concept album. Instead, there are only a couple of songs that deal with same concept. Why did you go for a full-concept album? Actually, there’s only one song that speaks of the Last Emperor! The rest of the songs deal with different lyrical themes. It didn’t cross our minds to make this one a concept album since we’ve already written some songs and the given state, I think, it could act as limiting factor for us. Also, it’d been a while since our first release so we got lots of different ideas on different topics. The cover is only about the title track. We did something similar with our first album where the cover was about the title track, “In the Name of God”, as well. Should we expect the story to continue in the future? Are there any plans for a concept album? We haven’t thought about it but we don’t dismiss any idea. If we find the much needed inspiration and decide to go for it, we could come up with a concept album. The majority of metal bands that write about historic themes from the middle ages (or around that era), most of the times write about knights, vikings, samurais etc. There are quite a few bands that choose to write about the history of Mediterranean or Eastern kingdoms. Why do you think this is happening? Excellent question! This is happening because the “Easter Roman Empire” it not popular! Apart from the music industry, the history of that geographical region around that era, is also ignored by Hollywood as well. In more than a thousand years of Byzantine Empire existence, there were epic battles, strongholds, symbols, glamour, diplomacy, royal houses, plots and conspiracies that’d make Game of Thrones to look like a children TV show. There are lots of themes bands could draw inspiration from, but unfortunately it’s not popular because there aren’t many things left from that Empire! After the first fall of Constantinople by the Crusaders, almost all of the artifacts, manuscripts, sculptured statues and city gold were taken away, stolen. Almost everything was destroyed. Whatever was left was destroyed by the Ottomans during the second fall. Only the church of Agia Sofia was left standing, but most of its wall paintings were destroyed. Near the end of the Empire, the Slavs destroyed everything in the northern borders, something that also happened in the south-eastern provinces while the borders were shrinking. So there’s not much left today to remind us of the Empire! In countries like Scotland, England & Germany, there are hundreds of castles and palaces from their middle ages. So as you might understand this triggers musicians’ imagination because people can go to a castle, see pictures of it etc… In Constantinople there’s not even an royal grave left from a millennium of emperors. This has resulted to the constant shrinking of Byzantine studies worldwide. So, since there aren’t many traces left, almost nobody cares from an artistic perspective, even though the should… For example, how many people know that Vikings were spreading across Europe when they were greatly defeated by the Byzantines using the Greek Fire, and that later they [Vikings] were appointed members of the Emperor’s bodyguard (the elite Varangian Guard)? These are magnificent topics for someone to draw inspiration from. Having listened to the first album and knowing the positive feedback it got from fans and critics alike, I’d image it’d be relatively easy for you to find a label to release your album. Was it releasing it by yourself a conscious choice or it was how things played out? Our first album on Metal On Metal did pretty well. The copies of the album the band received as part of the merchandise, were sold out about two months after the album was released. When we went public about releasing a new album we were contacted from some labels, but given how things are nowadays in the music industry, our choice was to release it on our own. I believe this is the best option for underground bands, unless they get a very good deal. However, doing things on your own requires a lot of time, effort, scheduling, contacts etc. Anyways, from a sales perspective we were right to do things our way to this day, always taking into consideration how factors like piracy, illegal downloading etc. Is there a distributor for the album in Greece and abroad? How people can purchase your album or come in touch you? The album (CD) was released in a special 3-fold digipak format which can be purchased through our website at ragenheart.net/shop. People may also visit our website to find the links to the digital version of the album as well (iTunes, Google Play, Amazon, Spotify, etc). “The Last King” is also sold at No Remorse Records (Athens) and Steel Gallery (Thessaloniki) record stores. These two stores distribute the album abroad through their network. People may contact us via our website (ragenheart.net) and on Facebook by searching by the band’s name. Is there anything else you’d like to say about “The Last King”? I’m very satisfied and proud we managed to release this album exactly in the way we wanted. I wouldn’t change a thing about it. Everything done in this album was a result of inspiration and love for what we do, exempt from pointless things and filer tracks. I’m really happy about the positive feedback we’ve been getting so far as well. In this album we did everything on our own terms and watched our efforts turn into an official release. Which will be the next steps from here? Are there going to be any live shows to promote the new album? At first, we want to do a show to kick-off the release of our new album by presenting it live on stage. There are plans for a few shows after this summer so we’re trying to book some dates around that time. For the time being we’re rehearsing but we’re always open to proposals for live shows. I know it’s probably too soon for this, but do you have any thoughts or material for a third album? Yes, of course. There’s new material as I’ve been working on some ideas during the previous years. I’d say at least five new songs could come out of this, and at the same time, John has been working on new stuff as well. I guess we’ll start rehearsing after the bulk of live shows. That’s all on my end. Thank you so much for taking the time to answer my questions in detail! I truly wish best of luck with “The Last King” and RAGENHEART in whatever you do. I’ll leave the closing remarks to you! Thank you so much, Giannis, for the many and interesting questions. We’re given the chance to share many things about the band and lot’s of – what I’d like to consider as – interesting details.